Description of "English Learning Made Easy- Strategies and Approaches"
Books are always our best companion. The idea of writing or editing a book remains always in our mind. Our students come from semi-urban background and not very fluent in English reading, writing and speaking. English is not just a Second language to them, but it is completely a foreign language to the rural background pupils. So, we research innovative techniques to make them familiar. This continuous research motivates us to edit a book on the topic. We can well see the potential of the book as it is not just about the ‘Teaching’ of English but basically about ‘Learning’ English as such. But of course it will be very helpful for ELT, per se. The book making is a long process and it needs a careful study of area, topics and research methodologies, along with very intensive and extensive genuine research work before we start. The very first thing which struck our mind was to choose the topic which could be beneficial for students and teachers both. Our undergraduate students, who actually lack Basic English speaking, reading and writing standard, gave us many new topics to write. They and their problems motivated us to collect opinions of our fellow colleagues on the wider perspectives of the chosen topic and edit a book on the subject. We have endeavored to cover many areas which need to be given emphasize when we teach or learn English. Our main focus is to give tricks and useful tips to enhance and learn English as a second language. 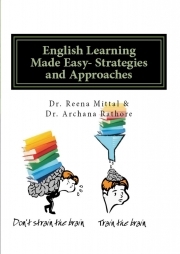 Reviews of "English Learning Made Easy- Strategies and Approaches"